I am a member of the Everywhere Society and Everywhere has provided me with compensation for this post. However, all thoughts and opinions expressed are my own. Last year I had the pleasure of attending the Macy’s Culinary Council Cooking Demo here in Louisville. While there I interviewed Johnny Iuzzini and was able to watch as he whipped up some dessert magic. 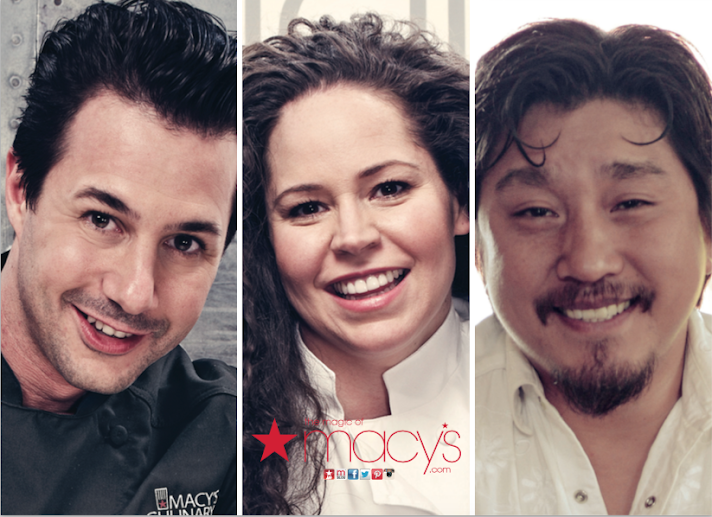 I’m really excited to share that he’s returning to the Macy’s at Oxmoor Center again this year, and will be accompanied by Stephanie Izard (season 4 winner of Top Chef) and Louisville’s own Edward Lee. Whether you’re a Louisville native or if you’re just in town for the Kentucky Derby, I’d love to have you join me at this year’s cooking demo! In addition to seeing Johnny Iuzzini again, I’m kind of stoked that Stephanie Izard is going to be there. Top Chef has been one of my favorite shows over the years, and she’ll be the third Top Chef contestant I’ll have the chance to meet. Chef Edward Lee will be the fourth (he was on season 9)! It’s really going to be an amazing night full of food that will rock your Derby party. I’m still drooling a little over the lime shortbread cookies from the last demo. Purchase $35+ in the Home Department at Macy’s and you’ll receive one of the chef’s cookbooks + a $10 Macy’s gift card. Purchase must be made April 29, 2015 at Macy’s Oxmoor only. Gift cards and cookbooks will be distributed April 29. **One per customer, while supplies last and time permits. Seating is first come, first served. Macy’s gift card valid April 29th-May 6, 2015. If you can’t make it in person, be sure to follow me on Twitter and Instagram; I’ll be sharing lots of updates the night of the event to help you not miss a thing. What would you like to know about Johnny Iuzzini, Stephanie Izard, or Edward Lee? I would love to check it out I will have to see how my schedule is next week. My in-laws are moving from Louisville out to our area so next week is pretty busy. Sounds like a fun event!